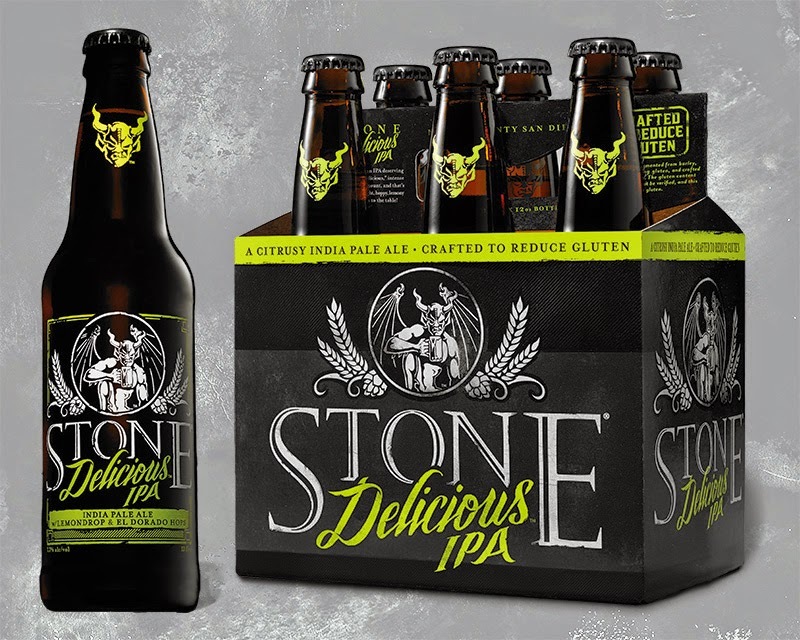 Stone Brewing is getting in the gluten "free" beer game with a boastfully named Delicious IPA. Like Omission beer Stone is using an enzyme to break down the gluten protein chain in order to make it easier to digest for those who can't. I haven't had it yet but it sounds pretty awesome especially those who are doomed to live a life of sorgum and buckwheat beer. ESCONDIDO, CA (Jan. 5, 2015) – Since 1996, Stone Brewing Co. has been obsessed with its mission of providing people access to high-quality, big-character craft beer. After all, great beer is for everyone and anyone with the good taste to recognize it. With that goal in mind, the company is introducing Stone Delicious IPA, a citrusy ale dry-hopped exclusively with El Dorado hops. As if that wasn’t enough, the beer has also been crafted to reduce gluten. 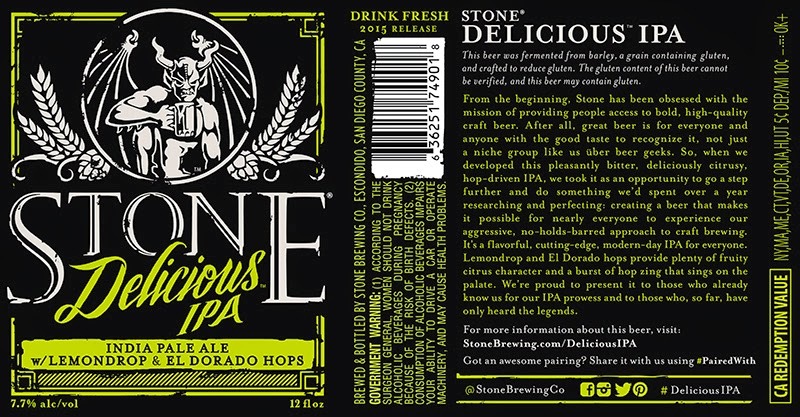 Starting today, Stone Delicious IPA will begin arriving in 12-ounce six-packs to retail accounts and on draft to restaurants and bars where Stone beer is sold. 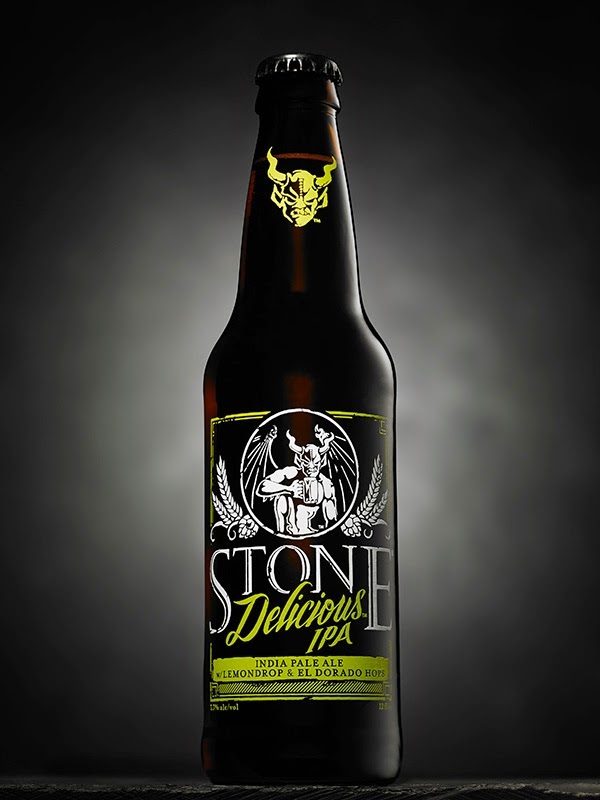 Steele has taken Stone Delicious IPA a step further by creating a beer that may make it possible for individuals sensitive to gluten, or anyone looking to reduce their gluten intake, to experience Stone’s aggressive, no-holds-barred approach to craft brewing. With the addition of an enzyme from San Diego-based White Labs called Clarity-Ferm, gluten protein chains are broken down, separated and denatured to measure below 20 parts per million². This process, which is initiated during the beer's fermentation, does not affect its color or, more importantly, its wonderful aroma and decidedly delicious flavor. 1 Due to uncontrolled conditions when served from draft lines, Stone cannot guarantee that Stone Delicious IPA on draft is gluten-reduced. 2 Stone Delicious IPA was fermented from barley, a grain containing gluten, and then crafted to reduce gluten. The exact gluten content of this beer cannot be verified, and this beer may contain gluten. Appearance: Pours deep gold with a white-colored head. Aroma: Spicy, herbal and citrusy hop aromatics balanced with light-toasted malt. The spiciness is reminiscent of lemongrass. Taste: The hop flavors really explode with a dominant flavor that reminds many on the brewing team of a lemon Starburst candy! Palate: Medium body with a bitter, dry finish. Overall: We went through many iterations of this beer at our Stone Brewing World Bistro & Gardens – Liberty Station restaurant and brewery, using several hop recipes until we had that “Aha!” moment tasting a beer that I had asked Liberty Station Brewing Manager Kris Ketcham to brew. It was a single-hop beer called the Lost City of Liquid Gold, using 100 percent El Dorado, a new hop from Yakima, Washington. This beer gave us the last piece to the puzzle on the formulation for Stone Delicious IPA. We changed the dry hop to 100 percent El Dorado, and we achieved magnificent lemon candy and spicy hop flavors that are fun and unique.